Aqua & Marine is a well-appointed one bedroom cottage at Paraparaumu Beach. A fully equipped kitchen provides a dishdrawer, fridge, convection microwave oven, and induction hob. A Nespresso coffee machine is provided together with a range of herbal and plain teas. The lounge room has comfortable modern seating, Freeview TV, Netflix, and free wi-fi is available throughout. Large slider doors open out onto a deck where BBQ facilities are provided. A tiled bathroom with a walk-in shower, toilet, vanity and underfloor heating together with a hairdryer, large spa towels, and beach towels. The cottage has heatpumps and ceiling fans in the lounge and bedroom, and double glazing provides winter warmth and coolness in summer. The bedroom contains a queen size bed, with a slider door providing access to a deck. This modern furnished cottage is situated down from the main house. Guests have their own entrance via a red door at the side of the cottage with off street parking by the cottage. 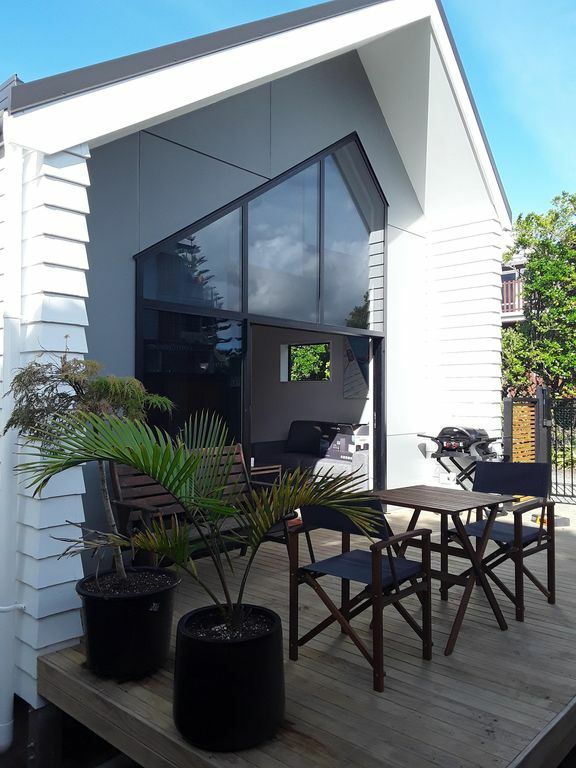 Aqua & Marine’s ideal placement enables a short stroll to Paraparaumu Beach Village shops, cafes, restaurants and beach, with the Kapiti Island Ferry, Golf Course and Boat Club a two-minute walk away. A bus stop is across the road which will take you directly to the railway station and Coastlands Mall. From the main house a Spa Therapy business operates providing luxurious and relaxing treatments from a fully qualified Spa Therapist. Should you wish to book a treatment during your stay please contact us. Aqua & Marine is a handy and relaxing getaway in a modern comfortable cottage. A discovered treasure! Just delightful, very modern decor, and so close to shops, beach and cafes. Wine, cheese, crackers and grapes really appreciated.very quiet retreat. Thanks Marg. I am so glad you had a delightful stay with us, and hope you can come again! The home is easy to find and has a clear parking area. It's easy to get inside, and the place was very clean. The hosts were very friendly and helpful, and it's a great location to access the beach or Wellington. Thank you Ruth.....we enjoyed having the 3 of you from the States and do hope you had a great last week touring around the North Island. Lovely well appointed modern cottage in a great location. Very warm, friendly owners. Would stay again. Thanks Margaret....would love to have you stay again. This lovely unit was so quiet and yet only a quick walk to good coffee and the beach. We loved our stay and will definitely return as soon as we can ........big recommendation to anyone thinking about staying in this region. Thank you Jackie....we so enjoyed having you and Charlie staying with us and will look forward to you guys coming back!